Dedicated focus on reducing a business’ waste streams can provide huge cost savings; savings that compound every week of the year. But without waste management expertise, it’s easy for leaders to underestimate how much money they’re leaving in the trash. In 2008, Jaclyn McPhadden, co-founder of RecycleSmart, became an entrepreneur to solve this problem. Jaclyn was a biology graduate in her mid-20s who had just started a career in hotel management after spending years leading adventure tourism expeditions in the Arctic and Antarctic. Jaclyn asked her managers if she could put together a plan to green the hotel’s operations, and went to work researching best practices. She found strategies that would not only reduce environmental impact by diverting waste from landfills, but would also save the hotel material sums of money. Believing that other businesses would want to benefit from this expertise as well, Jaclyn and co-founder Colin Bell started RecycleSmart in 2008 off the sides of their desks. 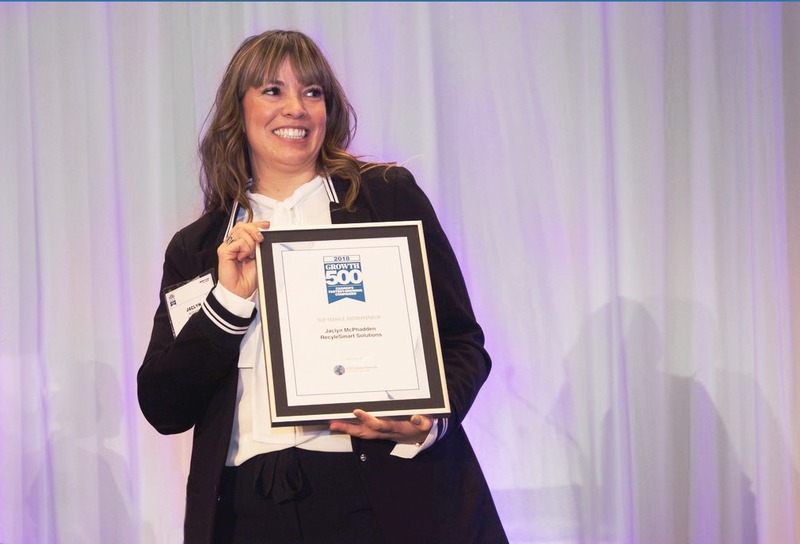 Ten years later, Jaclyn now holds the distinction of being the Growth 500 Female Entrepreneur of the Year 2018, having grown RecycleSmart into Canada’s 14th fastest growing business in 2017, and Canada’s 12th fastest growing business in 2018. Her business makes revenue as a proportion of the cost-savings achieved for clients. If no cost-savings are implemented, the client walks away having received a waste audit for free. The fact that RecycleSmart is a $20 million revenue company, that’s grown 5000% in the last five years, shows just how big of a need there is for better management of business waste in Canada. RecycleSmart then consults businesses on how to reinvest cost savings towards improving recycling and organic collection to reduce overall environmental impact, and manages the implementation and long-term operations of the strategy. Methane produced by organic materials sent to landfill represent about four percent of Canada’s GHG emissions – so just by responsibly managing organic waste, organizations can take a meaningful stand towards combatting climate change. RecycleSmart therefore offers a no-cost, multiple rewards value proposition to clients. But it can still be a tough sell. In 2010, Jaclyn and Colin decided it was time to seek additional financing to confidently be able to hire their first staff, but they were repeatedly shut down. “Even though we were profitable from day one, so we had two years of financial statements, no banks wanted to help us at all,” Jaclyn admits. Adding to this barrier to financing, there is a perception among some business leaders that going green equals increased cost. Luckily, Jaclyn and Colin got the break they needed when they came across a non-profit called Futurpreneur that provides collateral-free loans for entrepreneurs under 40 to launch their start-ups. The Futurpreneur Start-Up Program also paired them with a hand-matched business mentor, Terry Thompson, who Jaclyn credits as an invaluable part of her business success. RecycleSmart further bolstered growth through the integration of IoT technology into their waste management practice – a pioneering innovation in the waste industry. By installing sensors on all the bins they manage across the country, they’re able to monitor bin levels and optimize pick up schedules nationwide from the comfort of their Richmond HQ. Jaclyn also invested in completing an MBA while growing RecycleSmart. She says this in-depth business education has helped her better understand and speak to the concerns of business leaders that don’t immediately see the value of ‘going green’. Compared with ten years ago, when Jaclyn thought ‘why wouldn’t everybody do this’, Jaclyn says she has greater appreciation today for the barriers to change, and encourages entrepreneurs hoping to start green ventures to connect sustainability with financial and operational benefits. 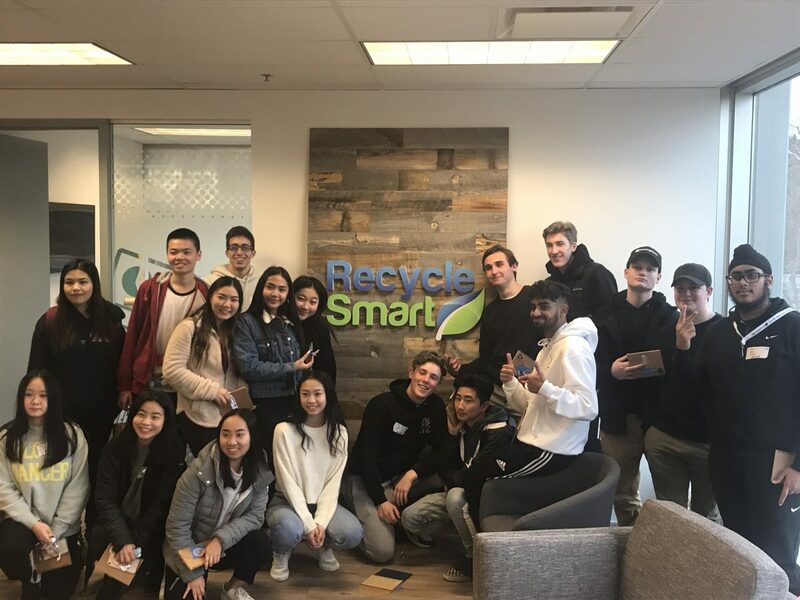 Today, RecycleSmart manages waste from coast to coast, with employees concentrated in the Vancouver, Calgary and Toronto areas. By continuing to introduce new innovations in sensor technology – that will allow deployment in more remote regions of the country where there is less bandwidth infrastructure, Jaclyn plans to continue climbing up the Growth 500 Rankings by reducing waste. With the business on a solid foundation and strong growth trajectory, Jaclyn and her team at RecycleSmart are now focusing some of their efforts on paying forward the help and support they received from Futurpreneur and others along their journey. In December 2018 they partnered with the City of Richmond and the Young Entrepreneur Leadership Launchpad (YELL) to host a group of high school students at their headquarters to share their entrepreneurship stories and help inspire the next generation of entrepreneurs.